Whether with natural or artificial flowers or plants, you can create beautiful centerpieces for a fraction of the price you'll pay in the shop. And no need to be an artist to make cool stuff. Just get your inspiration from models found on the Net to choose the style you like. And then try your luck until you love your creation. That's why today we are sharing 12 beautiful ideas. You can see if you prefer centerpieces made with flowers, or plants. You can then opt for a natural or artificial version, according to your needs and your means. 1) Water pearls look so beautiful in glass vases with natural or artificial flowers. Choose the pearl color to match the flower color you add to the vases. 2) Natural flowers simply cut and placed in a vase ... A classic and elegant style. 3) The choice of flower pot is very important, even for artificial flowers. 4) White, pink and gold are 3 beautiful colors to pair. 5) Assembling various white flowers can also be very interesting. 6) If you like succulents, you can make very beautiful gardens that you can cultivate and maintain over time. 7) Using silk flowers can make for a very pretty table ... Just make sure to choose pretty flower pots to place them in. 8) Succulents and cacti have the same needs. Little water and a lot of sun. So you can grow them together. The mixture of earth and stones is also interesting to use for this kind of centerpiece. 9) Artificial flowers are very practical for this kind of table decoration. 10) You can also take apart artificial flowers to paste just the flowers on a rod or a piece of felt to create this kind of decor. 11) Cacti, succulent plants, gravel, stones, green moss, bark or pieces of wood. 12) And finally, a mixture of lemon slices, hydrangea flowers and white roses. 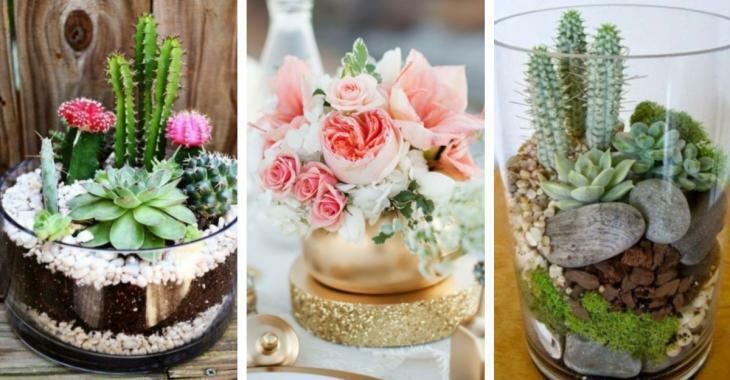 Do you like all these beautiful centerpieces? Share them!